​Residents of Island Bay and Berhampore have probably received this flyer from the Island Bay Residents Association (IBRA) in the last few days. IBRA are being disingenuous by implying that a successful judicial review means "getting our wonderful wide Parade back". It doesn't [Note 1]. ​It's also worth noting that IBRA's 'Option E' solution has not been consulted on four times as implied by the flyer. 'Option E' was only developed by IBRA in late 2017 in response to the four options arrived at by WCC and their consultants as a result of the Love the Bay process. IBRA's Givealittle page also states that indicative costing for Option E is "to be confirmed but would be no more than $750k". This claim is false and IBRA has known it is false for at least 18 months. In the September 2017 Design Option Refinement report the cost of Option E is estimated to be $3.8m (page 8). Even accounting for the fact both these numbers are estimates that's a massive disparity that IBRA should have acknowledged. IBRA continue to describe themselves as incorporated society, including on their Givealittle page. However, they haven't held an AGM or approved any financial statements since Oct 2017, which is a breach of their own rules. In October 2018 they announced they were delaying their AGM until February 2019 despite there being no provision in their rules to do this. This also means that they haven't published any information about their finances beyond March 2017, which is almost two years ago. 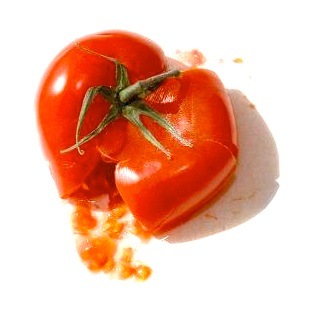 This failure is probably also a breach of the Incorporated Societies Act 1908, although in reality the Registrar of Incorporated Societies (the Registrar) is very slow to remove societies from the register for non-compliance, and the Act is so antiquated (it's been due for review for years) that it's barely enforceable. However, the High Court might put more emphasis on IBRA's legal status and whether they can legitimately take anyone to court right now. 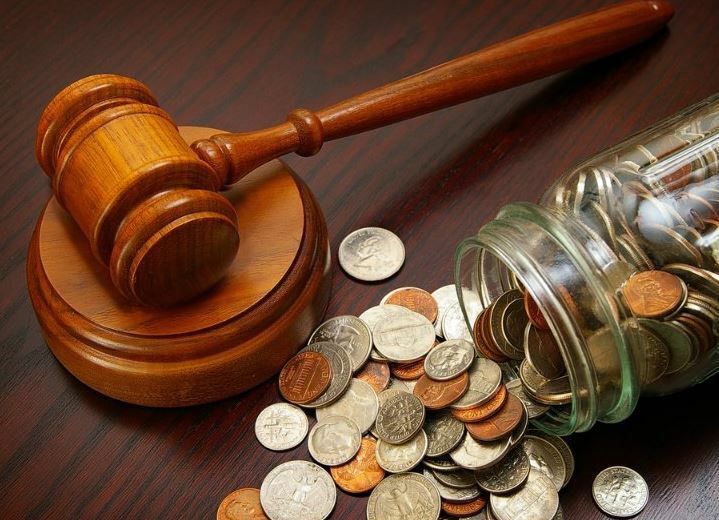 If the court date is set for May IBRA are running out of time to hold an AGM and submit financial statements to the Registrar as per the Act, assuming the High Court would even accept that. Their rules require them to seek nominations for the committee 30 days before the meeting so the earliest they can now hold an AGM is mid-late March. Of course, they will also need a set of April 2017 - March 2018 accounts by then, which would need to be submitted to the Registrar within a month of being approved at the AGM. Despite the fact that it might suit WCC I'd be very disappointed if the judicial review was delayed while IBRA did some of the basic house-keeping associated with being an incorporated society. As I outlined in my previous blog I'd like to see the review get through court as quickly as possible and bring a much needed conclusion to the whole saga. Any delays are also likely to cost more money in legal fees, which IBRA are funding out of the pockets of donors. In addition, if IBRA lose the judicial review and have costs awarded against them they will almost certainly then become bankrupt. That would mean the council's legal costs will fall upon ratepayers, so we all have an interest in the council's costs being kept to a minimum. Many of the same people behind IBRA were behind the Democratic Voice for Island Bay (DVIB) group who threatened a judicial review back in 2015. They quickly backed down but not before they had raised approximately $15,000, of which nearly $4,000 was via this Givealittle page. If you are considering giving to IBRA this time around you really should read the Q&A are make sure you are happy with the answers given to some of the questions. The key question, of course, is what happened to the money? Interestingly DVIB is still a registered incorporated society. According to the societies register it held an AGM on 30 September 2017 at which 8 of the 15 members were required to be present to form a quorum. At the meeting they approved annual accounts for the year ending 31 March 2016 and the year ending 31 March 2017, which is more sloppy house-keeping. It's not clear whether DVIB ever held AGMs by 30 September 2016 and 30 September 2018 in accordance with its rules. It certainly hasn't lodged any financial records past 31 March 2017 with the Registrar. 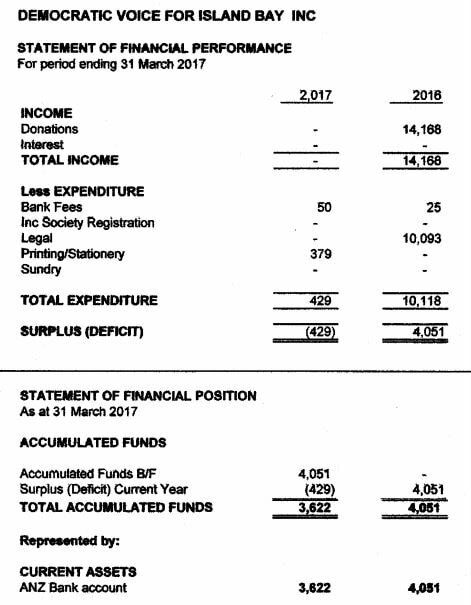 According to the societies register between September 2015 and March 2017 DVIB raised $14,168 in donations and spent $10,093 on legal fees, $379 on printing & stationary and $75 on bank fees. As at 31 March 2017 they still had $3,622 sitting in an ANZ bank account. Because they haven't lodged any annual accounts since then there is a two year gap in transparency over what happened to the money. Basically all DVIB ever achieved was to threaten a judicial review and then almost immediately back down, and they somehow managed to spend over $10,000 on legal fees doing it. As of March 2017 they were still sitting on nearly $4,000 and it's not at all clear who's currently in control of that money and what's going to happen to it [Note 2]. 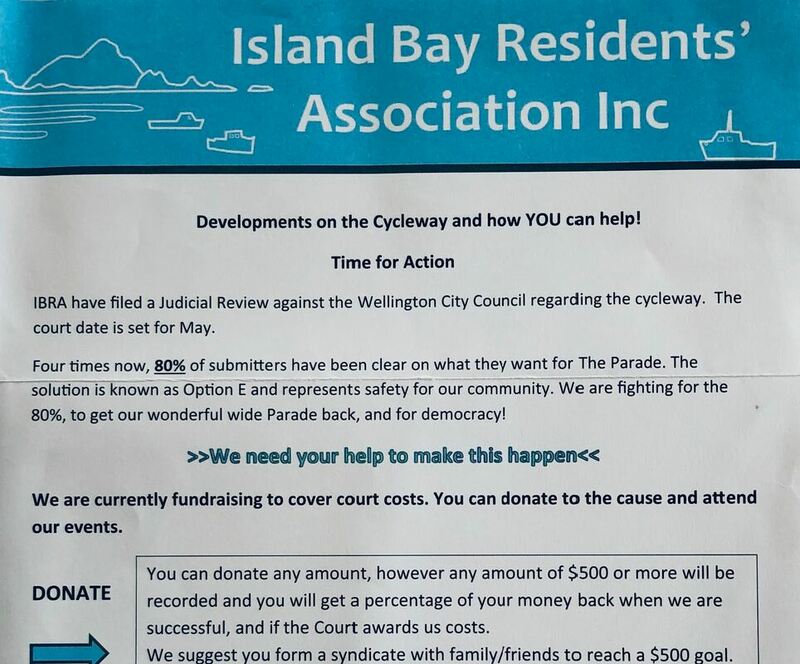 The press release announcing they were giving up on a judicial review said any funds left after paying legal expenses would be "put towards initiatives in Island Bay", which is consistent with their rules, but as of March 2017 that hadn't happened. Both DVIB's and IBRA's Givealittle campaigns are 'open goals' which means they get any money donated without having to meet a target and regardless of the outcome of their cause. Basically, if you make a donation then your money's gone no matter what happens. Of course, that's also true if you donate directly to their bank account. This time round IBRA are promising "you will get a percentage of your money back when we are successful, and if the court awards us costs" if you donate over $500. If you were one of the people who donated to DVIB I think it would be quite reasonable for you to feel pissed off at the outcome. If you still feel inclined to financially support IBRA's judicial review but don't want to see the same outcome again then maybe ask some questions first. I'd suggest the best place to do that is IBRA's Givealittle page where Givealittle's terms and conditions at least create a minimum requirement for transparency, accuracy and completeness of answers. Note 1. If residents are really determined to "get our wonderful wide Parade back" then a far more likely solution is for all on-street parking to be removed. That will actually create a more wonderful and wider Parade than ever before. It's worth noting that's a solution that is actually in the hands of residents right now and needs no intervention from the council. If getting a "wonderful wide Parade back" is so important, just stop parking on it. Note 2. If anyone associated with DVIB or IBRA wants to provide information such as minutes of AGMs, up to date copies of annual accounts, names of current committee members etc I'd be happy to publish that in a subsequent blog. I believe improvements are very important for people of all ages and abilities walking and biking (and scooting) around and through the Newtown Connections area. I have lived in Berhampore for 30 years now. 1. I recommend that WCC ask Tonkin & Taylor to develop Package Z – which combines the best of Packages A, B & C, with some new possibilities. 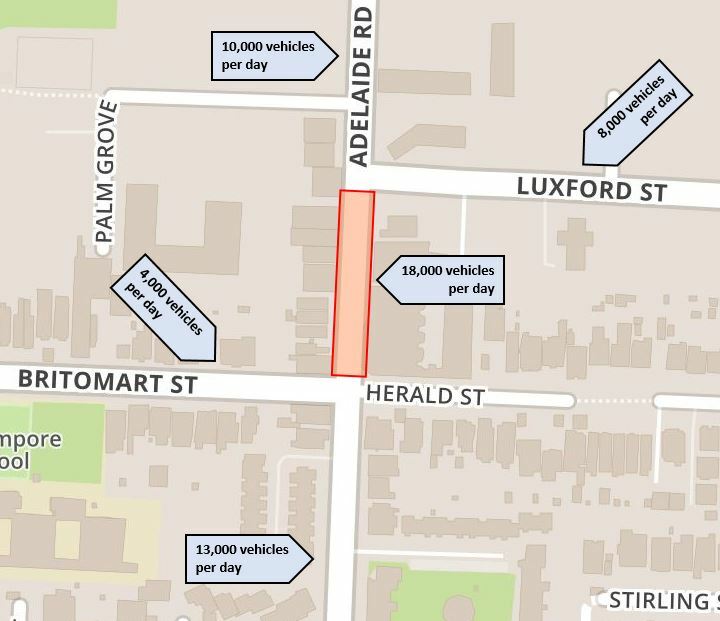 Most importantly, choose Rintoul Street to connect comfortably and conveniently from Luxford Street to Adelaide Road. Wilson Street, Owen Street, Wellington Hospital plus Hospital Road to conveniently and safely connect to cycle route up over Constable Street and into the Eastern suburbs. 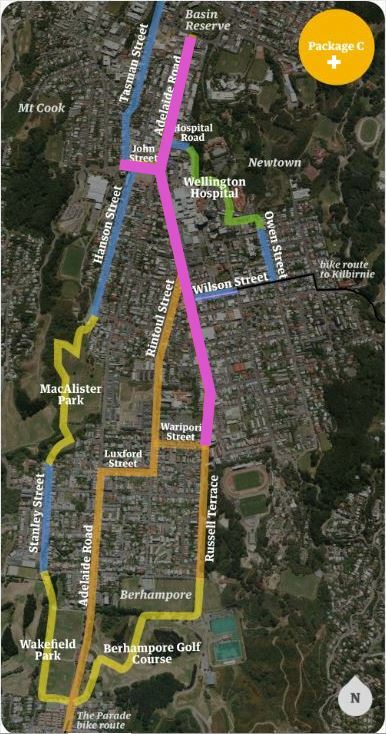 Both side routes to complement main commute routes – western Berhampore Golf Course, and eastern Wakefield Park, Stanley Street (pink), MacAlister Park, Hanson and Tasman Streets. Rintoul Street: on both sides (east and west) - one-way cyclepath adjacent to footpath and at same level; one-side carparks on either west or east side. Riddiford/Adelaide Road to Basin: on both sides (east and west) – one-way cyclepath adjacent to footpath and at same level; carparks on both sides. Complementary east-side & west-side routes: ensure all the off-road paths are well-lit with energy-smart movement-sensing lighting to increase social safety and maximise use. Stanley Street: west-side cyclepath initially next to bank and protected from falling debris, then same level as footpath northwards. Southwards cycling (downhill) marked by sharrows to take the lane. Russell Terrace: Remember this is likely to be used by many 10-12 year olds to bike to intermediate school. One-way cycle paths adjacent and same level as footpath. Protected from traffic with vertical posts. Design to physically slow traffic as this is a speeding zone. Do it right first time (rates, taxes and construction inconvenience are costly, also “dig once”). Over-riding rationale is safe cycling for all ages and abilities. 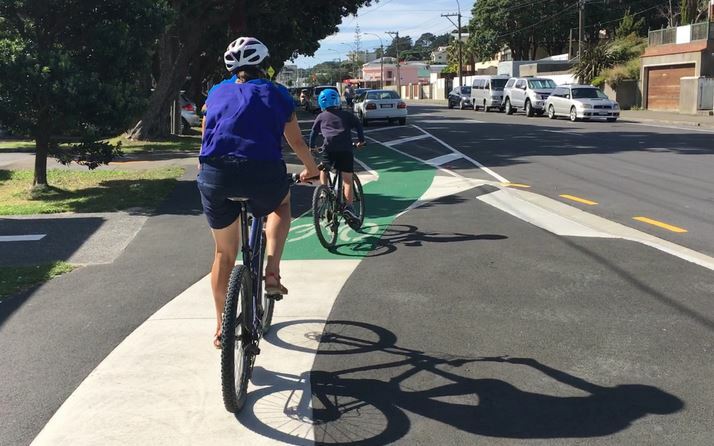 Time to prioritise a safe same-level kerbside cyclepath through our Berhampore Village – ahead of Island Bay’s third cycleway version. Don’t waste rates and taxes putting in a dangerous traffic-adjacent painted cyclelane that resembles Island Bay’s original dangerous door-zoner of almost 20 years ago. Time to design for the next two decades, not recreate past problems. Safer for everyone – speed limits that work; cycleways, walkways and “raised table” intersections that are safer for all ages, all abilities. Safe cycleways (and walkways) are only as safe as the most dangerous section. Future-proof - width for new people-powered transport, overnight E-car charging, actively reduce private car reliance to decrease inefficient land use & population growth congestion. Scope to build more cycling/scooting capacity, ditto walkways, as population grows. One way streets for all traffic? Consider likely routes for light rail this decade and beyond. (Cycleway width examples: passing slower bikes etc safely/ children’s bike chariots/cargo bikes/motorised disability scooters/adult tricycles/faster E-scooters & E-bikes/motorised disability scooters/side-by-side tandems, bikes pushing wheelchairs, 2 bikes in parallel). 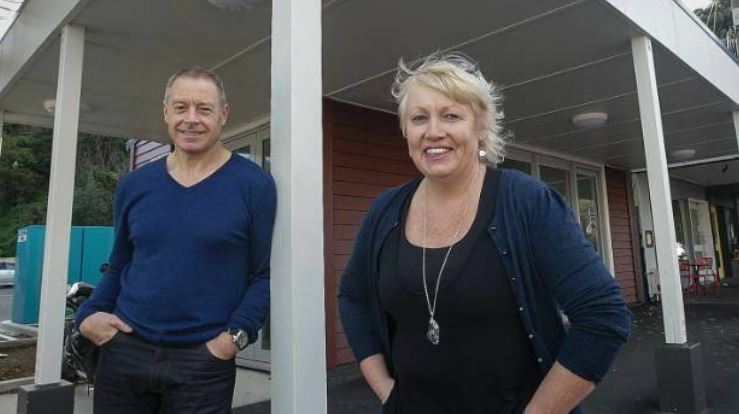 Attractive Berhampore Village heart for everyone – regardless of income, culture & transport. Quirky creative features that invite lingering, sitting and chatting, inside or outside our cafes. Signage, plant boxes, art, seating, community noticeboards, native & fruit trees. Colour! Vision of our Village – not a drive-through, time to slow down, respect and enjoy. Build unity in Berhampore community – respect for differing situations and needs, but overall fairly sharing scarce land and air resources. Practise for more climate changes. Think outside the concrete mixer – reduce demand for car parks, increase supply. Rates of change matter, calculate volumes and timing carefully to avoid business impact. In depth consultation for the most affected streets – businesses and residents, to understand and better manage varying individual impacts, including during construction. Interim changes in January – cut-through pedestrian pinchpoints and ramp up & down wide footpaths, coupled with peaktime clearways along Wakefield Park, Skate Park/Cycle Park, and MacAlister Park sections of Adelaide Road. More sharrows in the narrows – including repainting please over summer. 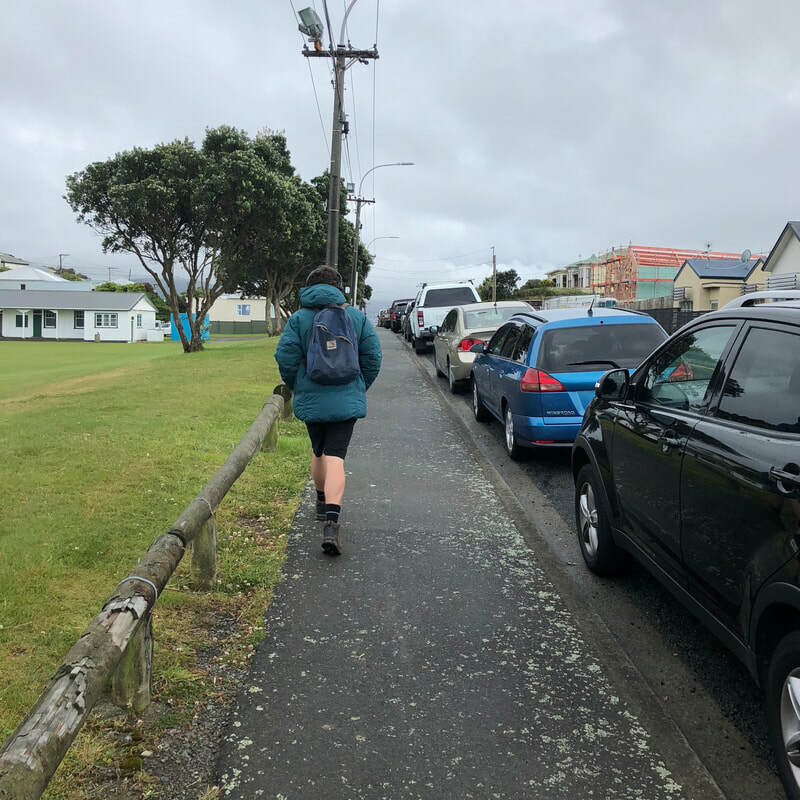 Public education about 1.5m safe cycle passing, 1m door zones, sharrows, not parking on footpaths and correct Island Bay cycleway car parking – with active monitoring, cameras and enforcement. Trial different treatments along Island Bay cycleway to make it easy for drivers not to park on the cycleway. Or start warning, then towing drivers that do park on the cycleway. Observation and photos suggest incorrect parking is unrelated to vehicle size. interest free loans etc for discounted bulk purchased pushbikes, scooters, e-scooters and e-bikes. Further discounts for community service card holders and families buying multiple items. diagonals on north-west stretch of Herald St, south-east Chilka St and other quiet wide streets? car-parking purchased from 25 Waripori Street apartment blocks – especially with carshare and interest-free loans etc as above. 4. Do we have to go Green? 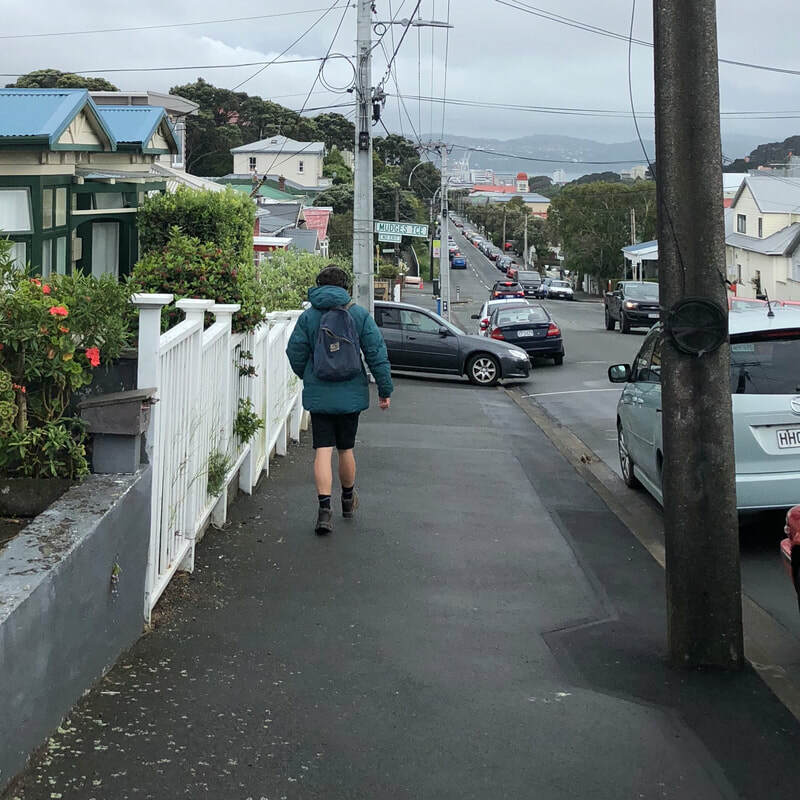 Sometimes “green” (painted cycleways) is over-rated – use natural colours to welcome into the heart of our Berhampore Village – or quirky bright colours? (But today’s bright quirky colours may date – so maybe leave these for features that are faster to recolour). Caramel coloured cross pavers clearly mark the space for cycling, but enable either walkers or cyclists to flow across if need-be and if clear. Also makes the shopping space more attractive. I recommend this 10 minute video: vimeo.com/13499122 for an inspiring vision of how Wellington could grow as a people-friendly city, and meet our challenges of projected population growth, housing crisis and climate changes. Dominion Post movie reviewer Graeme Tuckett had an opinion piece published yesterday that suggests some Quick and simple steps Wellington can take right now to help cyclists. Unfortunately it includes so many terrible reckons that it demands an immediate and very snarky response of counter-reckons. Before anybody has a moan about me being mean, consider this - Graeme has been given a massive platform from which to spout his views. This is a blog that I will be happy with if it gets half a dozen retweets and 20 Facebook likes. He's also got some previous form having demanded in his near-identical September 2017 piece that the council rip up expensive cycleway follies. To be perfectly honest Graeme looks like a man who can take a bit of criticism. It's what he dishes out for a living after all. I'll start with the one truly excellent point that Graeme makes "the council has the opportunity to do a lot of simple, effective stuff immediately, while it works on getting the design of the proposed new paths right". I certainly agree that we could do with more short-term, tactical trials of street changes that would benefit vulnerable road users. Unfortunately it's all downhill from there. Graeme's idea of what constitutes "simple & effective" falls desperately short of mine and the way he gets there is just riddled with errors and half-formed ideas. 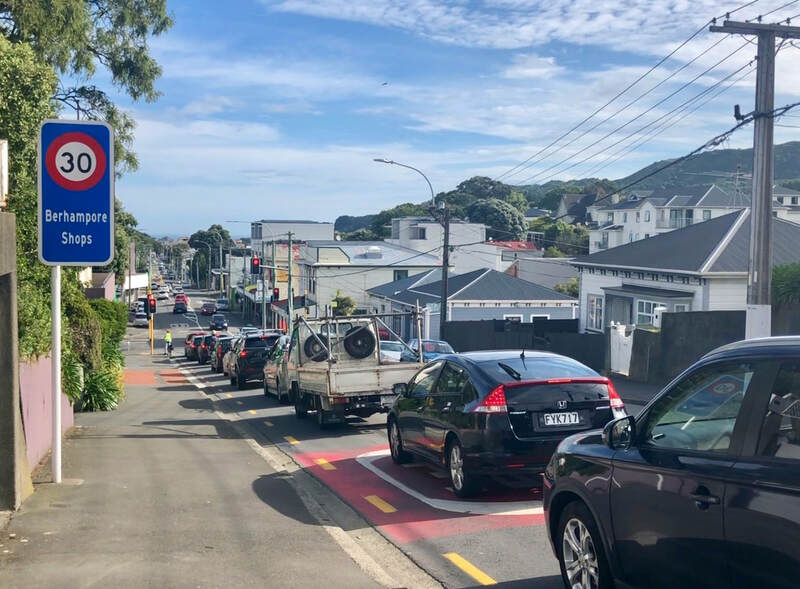 Graeme says: "Island Bay is a dangerous mess that hides cyclists from following traffic and forces us into contact with car doors and pedestrians, with no way to swerve around them." 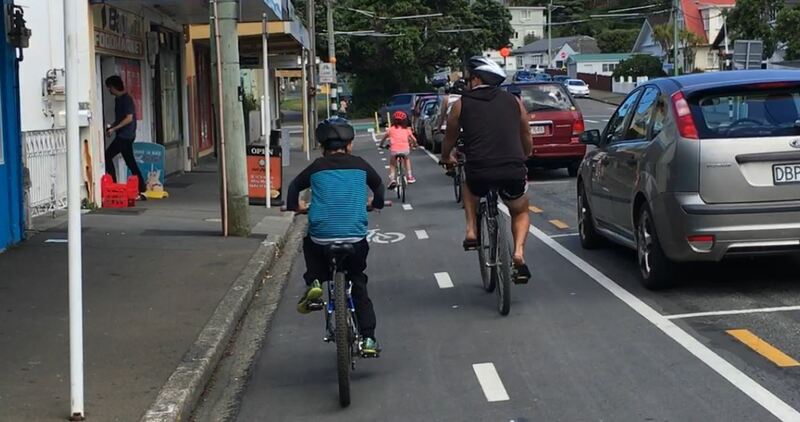 I ride the Island Bay Cycleway every day and I don't agree this is a significant problem. 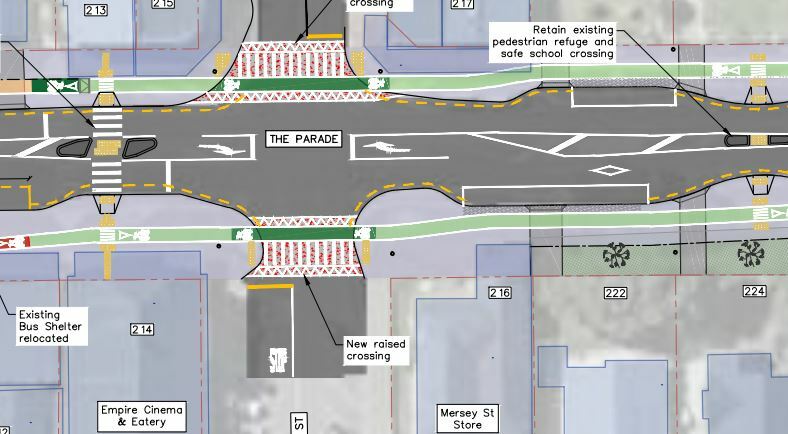 Even if it is The Parade re-design mitigates this by raising the cycleway to footpath height, which also allows cyclists to swerve onto the footpath if needed. This is much safer than swerving into traffic if you're riding on the road. Also, only 1/3 of all car journeys have passengers which greatly reduces the risk of encountering a car door opening on the passenger side anyway. It's just maths. Plus, the Parade redesign includes pretty generous 0.9m doorzone buffers which is basically the width of an open car door. Yes, everybody agrees that the original consultation around the Island Bay Cycleway could have been a lot better and that the current cycleway can be improved. But we went through a year long re-engagement process called Love the Bay to get to the Mayor's compromise solution. Does Graeme even realise The Parade is being upgraded? At the end of the day if visibility is that big a problem then the most simple and effective solution is actually to remove the on-street parking. Or are we only screaming about something being "a dangerous mess" until it might affect our ability to park right outside our house? 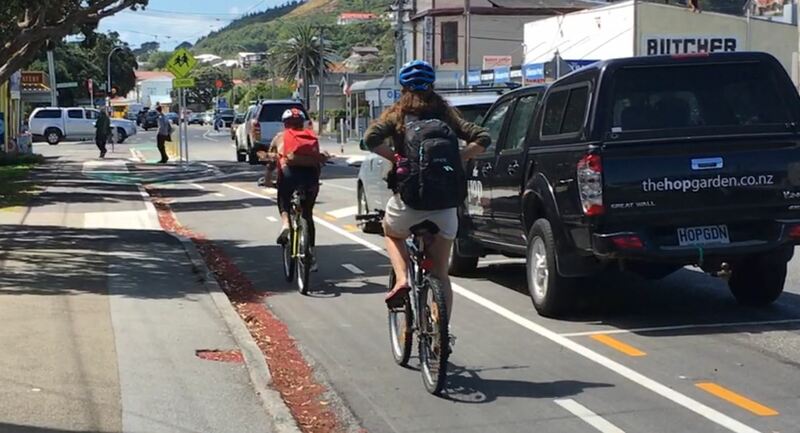 Island Bay Cycleway critics please take note; every time you complain about visibility you are helping to build the case for removing on-street parking. Island Bay kids who are much braver than Graeme Tuckett ride the cycleway he calls "a dangerous mess"
​Graeme says: "I've tried riding [the Island Bay Cycleway] a couple of times and gave up in disgust"
Two super-chill Island Bay residents ride the cycleway that made Graeme Tuckett "give up in disgust"
​Graeme says: "The Parade was already safer for cyclists than most. Wide shopping streets with 30kmh limits enforced by gentle speed humps are about as benign an environment as any Wellington cyclist (or pedestrian or car driver) ever hopes for." This is factually incorrect. 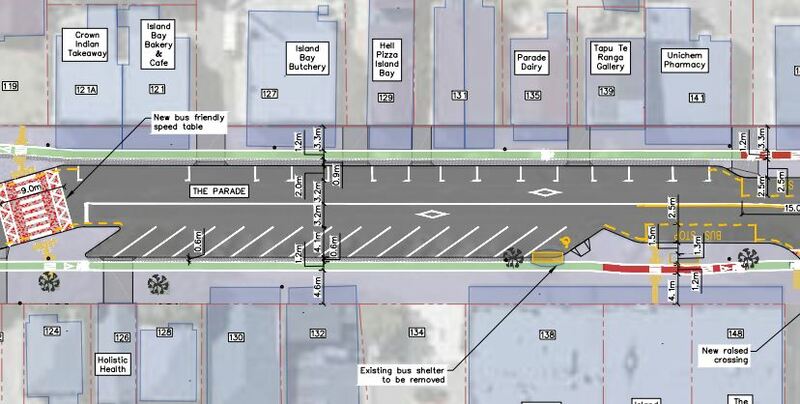 Most of The Parade is still a 50kmh zone and with 10,000 vehicle movements a day it is well over NZTA's threshold for where separated cycleways are recommended, as pointed out in Section 3.1.2 of the Sep 2017 Island Bay Design Report. The same report points out in Section 5.1 that the current road layout (including the cycleway) has successfully reduced 85% percentile speeds to the posted speed limit. That means that previously more than 15% of drivers on The Parade were speeding! And 15% (every 7th car) are still going over 50kmh!! That's 1,500 cars still going over the speed limit on The Parade every day. Let's be clear that if that's what Graeme thinks is 'safe' then that is entirely his own point of view and not the experience of many other people on bikes (and people who don't bike because it doesn't feel safe or comfortable being on the road). Let's look at Graeme's ideas for "quick and effective cycle safety measures that could be implemented immediately"
Graeme says: "Any cyclist heading into the city from Berhampore will take Stoke St on to Hanson St and then King St instead of riding on Adelaide Rd at all, if they know that route exists. So signpost it." Any cyclist? Speak for yourself. I don't take that route, not on my way in to town anyway. I prefer to carry on straight down Adelaide. It's more direct and I can ride at the same speed as traffic. But that's just me. On my way home I use part of the same route Graeme is suggesting but not the rest. Other cyclists prefer to use Rintoul St or other routes. There's a theme emerging here. Graeme seems to think every other cyclist is like him and has the same needs as him. He also seems to think that this is just about improving the safety of existing cyclists when it's not. Sign-post your preferred route if you want but I don't think it will make even a modest contribution to making cycling a viable and comfortable choice for many more people, including kids. Graeme says: "Declaring the footpath on Adelaide Rd from Berhampore to Stoke St a shared path for uphill cyclists would be a no-brainer. It runs alongside a park, and cyclists going uphill are no faster than pedestrians anyway"
You're right it's a "no-brainer" Graeme but not in the way that you think. Shared paths are just about the only way you can make things simultaneously worse for pedestrians and cyclists. They are the Hunger Games of transport infrastructure, forcing pedestrians and cyclists into a hostile environment together so they can fight over the scraps left by cars and see who survives. Besides, the steepest part of that stretch of Adelaide Road has houses on it and the footpath is narrow. There's also a steep downhill section before getting to Stoke Street. Nope, nope, nope. Can we please just forget about shared paths and focus on getting decent separated cycleways in place? Graeme says: "30kmh speed limits – enforced by shallow road humps – are great for pedestrians, businesses, drivers and cyclists. Implement them now in every suburban shopping area and outside every school. They create a safe environment without the expense, controversy and disruption of a cycle lane." OK, but there's already 30kmh speed limits in many Wellington suburbs, including Island Bay and Berhampore (and a 40kmh limit in Newtown). Yes, more 30kmh zones would be welcome, especially near schools, but they fall well short of "creating a safe environment without the expense, controversy and disruption of a cycle lane". For one thing they still require people on bikes, including kids, to ride on the road. They also typically exist over short stretches of road which is no good for actually going anywhere. They help prevent crashes at those sites but people want to move between those places too. Comparing their utility to a cycle lane is a false equivalence. Graeme says: "I've been saying for years that the median strip between Kent Tce and Cambridge Tce would convert simply and easily to a shared cycle/pedestrian path, with no loss of parking." There's actually half of a good idea there but not as a shared path. 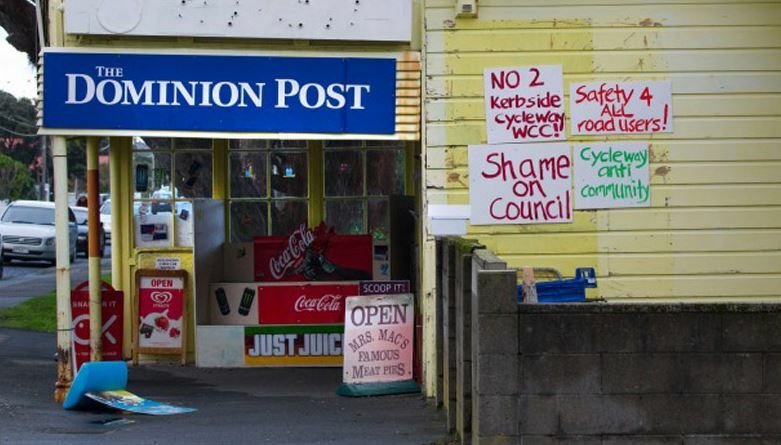 The fact that Graeme would promote this idea as being "simple and effective" while calling the Island Bay Cycleway a "dangerous mess" actually goes beyond being laughable into 'the awkward silence after laughter when you realise they are serious'. Cycle lanes along the middle of Kent and Cambridge Terrace would be good but let's do it once and do it right and put them in place of the on-street parking. It could be trialed very quickly and easily too (I'll help put out the road cones) although there would be some work to do at the intersections because actually, it's not quite that simple. Sorry Graeme, your conclusion that "the council has the opportunity to do a lot of simple, effective stuff immediately, while it works on getting the design of the proposed new paths right" is a good point but unfortunately it's buried under a pile of terrible ones. In your September 2017 opinion piece you confidently claimed that "I am the very definition of the person [cycleways] were designed for". Actually mate, as an experienced, middle-aged, male cyclist you're not the primary target for separated cycleways and your failure to understand that seems to be a big part of the problem here. You're just one of a large group of users and potential users of cycleways, all with their own particular views and needs. It would be great if you could remember that before the next time you use the massively influential platform you have to spout off. *I actually like some Adam Sandler movies and my kids love them. Which is the point right? Different strokes for different folks. ​The next stage of Wellington City Council's Newtown Connections project is now underway. Newtown Connections is part of a programme to develop a connected citywide cycle network so people of all ages and abilities can safely choose to make more trips by bike. The council is asking for feedback on three different packages of routes and possible street changes in Newtown, Berhampore and Mt Cook by Tuesday 11 December. You can read the council's media release here. 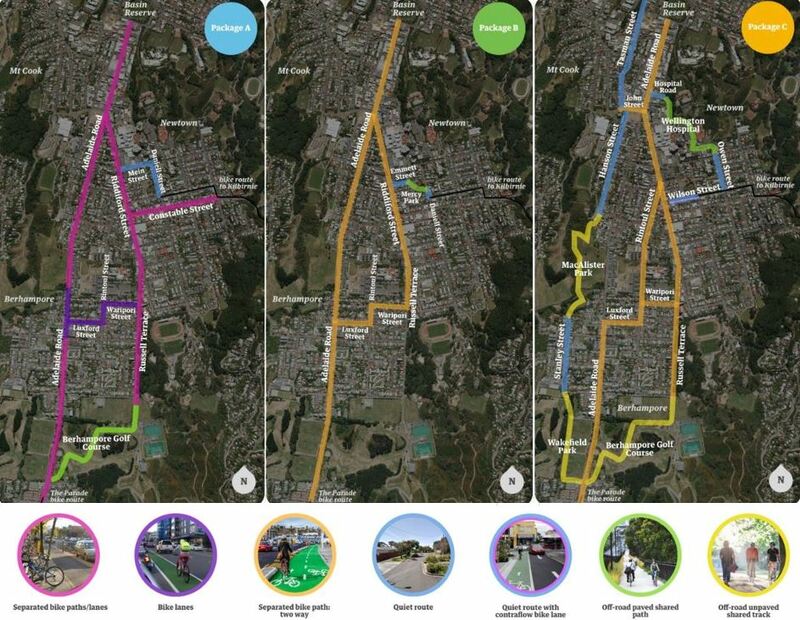 The Dominion Post also produced a reasonably balanced overview of what's happening despite the slightly reductive headline: Options revealed to connect Wellington's Island Bay cycleway to Basin Reserve. The current stage is the second of three opportunities the community will have to help shape what happens in the wider Newtown area. More than 770 people provided their initial thoughts a few months ago during the first round of community discussion. Eighty-five percent said it was important or very important to make it easier and safer for more people to ride bikes in and around the Newtown area. 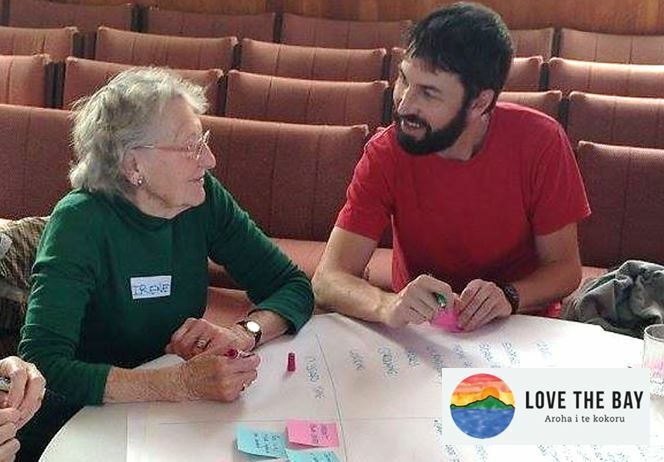 All the information collected is summarised in the Community Engagement Feedback Analysis Report, which also provides a good overview of the extensive engagement that occurred. The feedback was then used to create a Community Brief that summarises the community's wishes. The planners used the Community Brief to develop the packages of possible street changes that are now being consulted on. There's more information on how the packages were developed here. It's important to note that the packages are not discrete options and the consultation is not a vote. The council simply wants to hear what you think at this stage. As Mayor Justin Lester says “Nothing is at a detailed design stage yet, and no decisions on routes or changes have been made – so it is a very good time to get involved. The more community input we can get at this stage, the better.” Councillor Sarah Free says "we want people to look at the routes up for discussion, what’s possible, what’s likely to provide the greatest benefits, and what these connections would mean for various streets. The plan that’s developed could well be a mix of the different packages". I have to say I think Wellington City Council have done a great job putting all this together. It's by far the most comprehensive consultation on this type of project they've done so far. There's a lot of information to look at but the website is nicely done and easy to understand. You can look at an overview of the packages and then go through each one section by section. There's also a very comprehensive summary of the parking impacts of each package. Here's animated gifs of each package that give a better idea of what the treatments will be in different areas. Don't forget that if you go to the Newtown Connections website and click through the detail of each package you can see what the proposed treatment for every section of each package is. The good news is that all the packages will be a vast improvement on what's there now, which is basically nothing. Every package gives someone on a bike the ability to cycle from Island Bay to Newtown and on to the Basin Reserve entirely separated from motor vehicles. However, a bit of a problem in my mind is that two of the packages (B & C) rely very heavily on 2-way separated bike lanes. 2-way bike lanes are OK but they're really not ideal. Some cycling advocates think bi-directional bike lanes are a folly while others take a more pragmatic view that they can sometimes be justified. The main reason they appear to be used so much in these packages is to save space, and on-street parking. In principle, I think the default treatment in an urban environment should be to use 1-way separated bike lanes on both sides of the road wherever possible. What "wherever possible" means, and how that impacts parking, is going to be at the heart of the debate. It also seems to me that the designers have tried to use one consistent treatment within a package as much as possible. This is presumably to minimise the transitions from one kind of cycleway to another i.e. from 1-way to 2-way and vice versa. I don't think we should be too concerned about transitions between different types of cycleway. 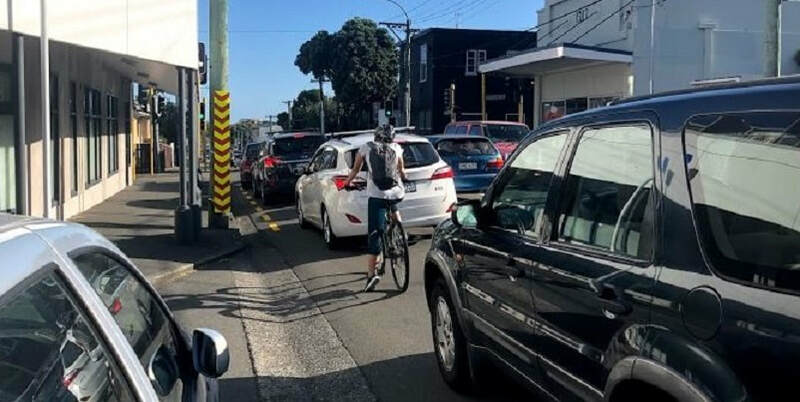 Mainly because we're not going to be able to avoid this in Wellington unless 2-way cycleways become the norm, which would be dumb & significantly lower the overall level of service of the network. Transitions can be managed as long as they are well-designed. For example, anywhere where there is a set of traffic lights it should be relatively simple to design a transition from one type of cycleway to another. So, on balance, I am leaning towards Package C as being the one worth developing further. It has the best overall connectivity and greatest number of options (both routes and types of cycleway) for people on bikes to choose to get around. Package A looks good too, but does have a big impact on parking. It's also not quite as connected as Package C and I think I agree that putting cycleways on some of the steep gradients along Adelaide Rd would not be the kind of 'all ages & abilities' infrastructure that the Community Brief demands. How well each package meets the objectives set by the community in the Community Brief is a really fundamental question. 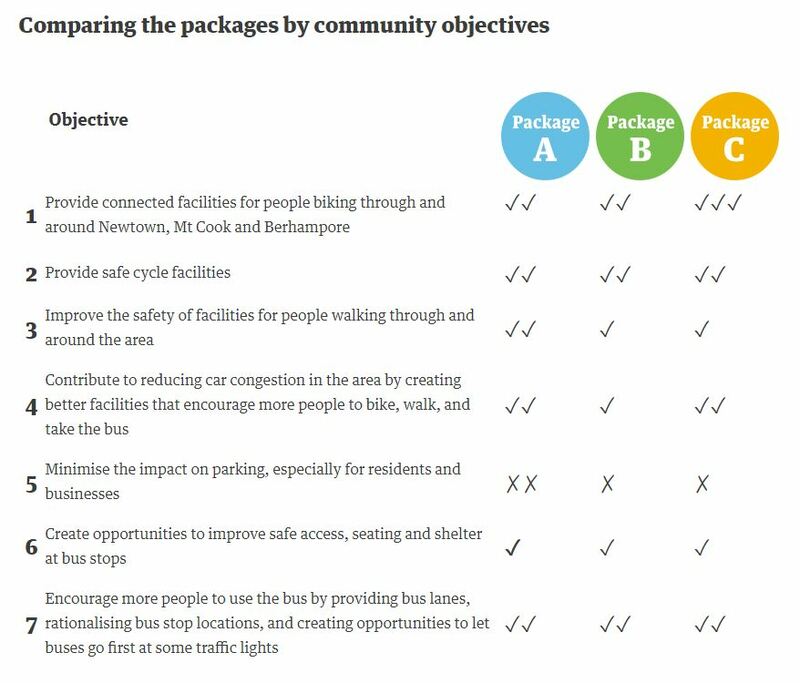 Wellington City Council have done their own analysis of that and I think they've got it about right, with Package C just edging out Package A. What do you think? 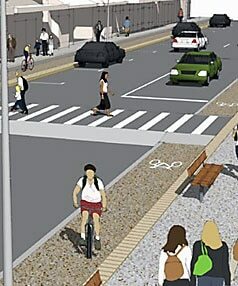 ​​However, although I like Package C I think it is far too reliant on 2-way cycleways. I'd like to propose a Package C+, in which the entire stretch from the Basin Reserve, along Adelaide Rd (to John St) and Riddiford St (to Russell Tce, maybe as far as Waripori St) becomes 1-way separated lanes. Package C+ would look a bit like this. The pink is 1-way separated bike lanes on both sides. The orange is 2-way lanes. Yellow and green are off-road paths. Blue is quiet streets. The key to this is that Package C+ can be done with no additional impact on parking (if I'm reading the detail of Package A correctly, where this is already the treatment along that stretch). If so, why on earth wouldn't we do it? In fact, it's the absolute minimum we should do. Once you've done that it really does beg the question whether you go further & put in more 1-way cycleways (potentially joining up with the Island Bay Cycleway) even though it will then start to impact on parking. 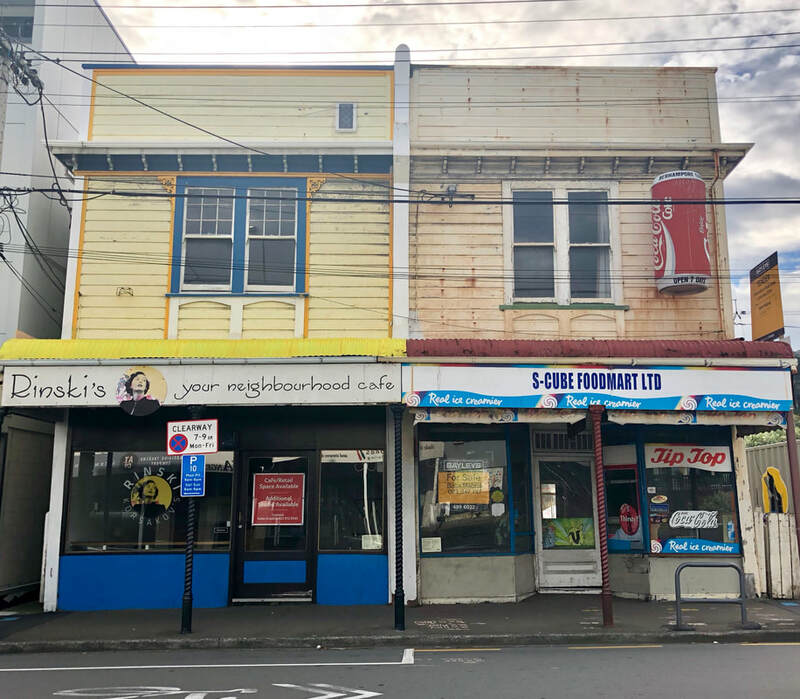 The focus of that discussion would be firmly on Waripori St and Luxford St to get across to Adelaide Road before carrying on from the Berhampore Shops to Dee St. 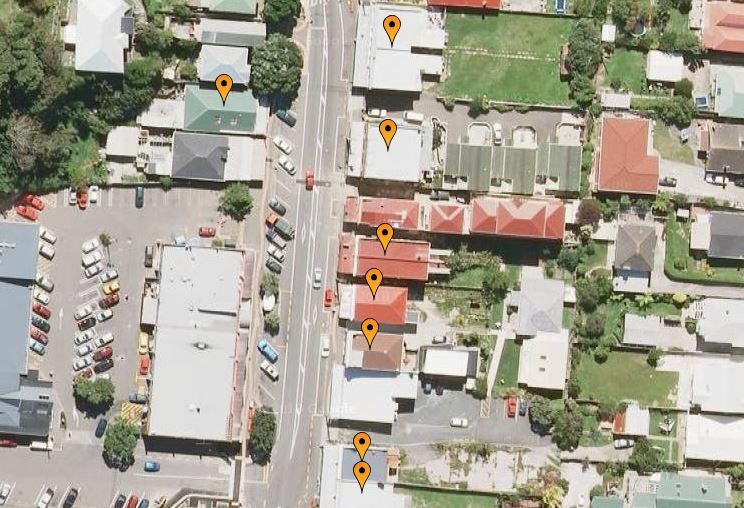 If we extended C+ along Waripori, Luxford & along Adelaide Rd from the Berhampore shops to Dee St I think that would add approximately 120 parks lost to Package C (approximately 350 lost in total). 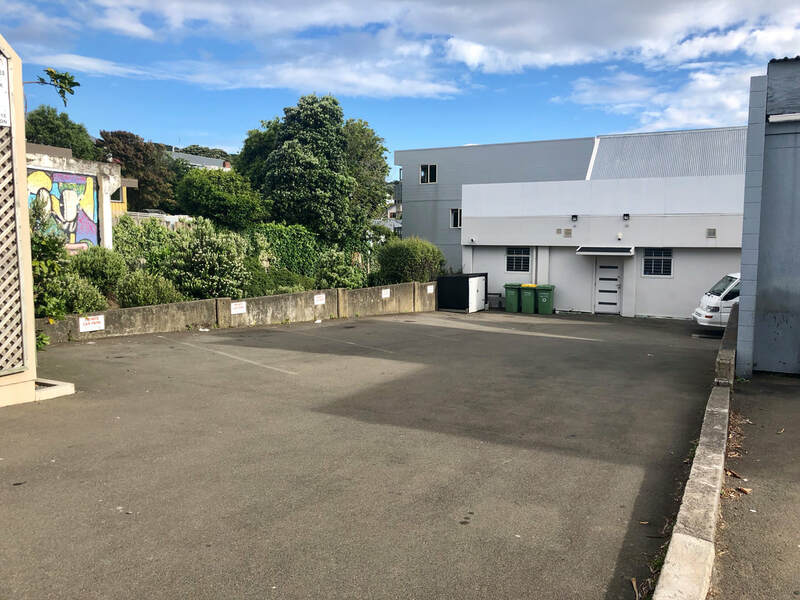 We could, and should, also have a discussion about Rintoul St. Will this be the moment that Wellington City Council finally steps up and says unequivocally that mobility and safety are a higher priority than on-street parking? 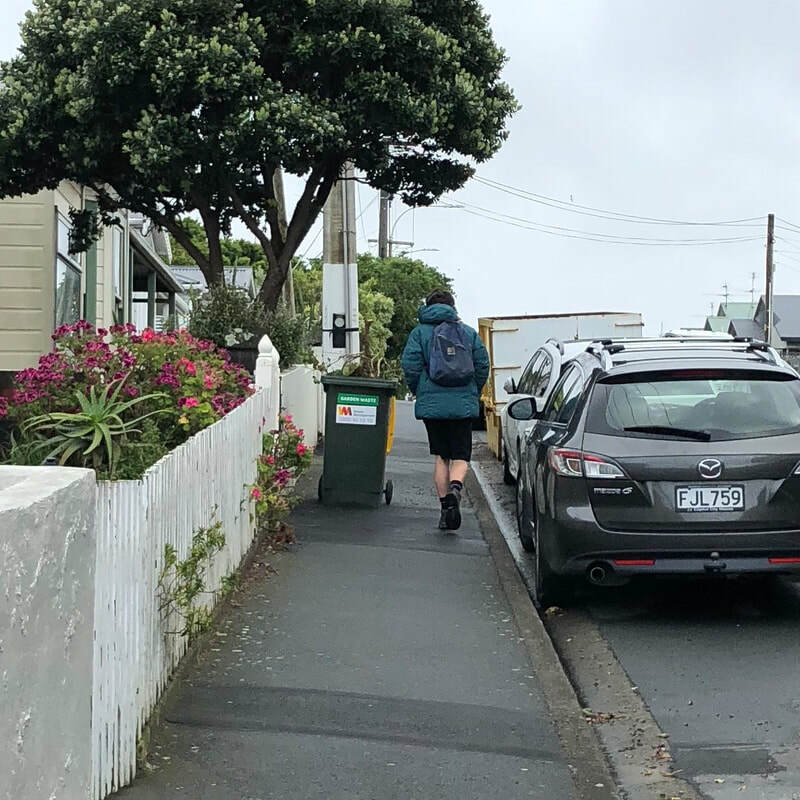 If so, Rintoul Street provides a more direct route to connect possible 1-way lanes in Newtown to the 1-way lanes we already have in Island Bay. However, this would result in a reduction in on-street parking on Rintoul Street of an extra 75 parks (over what is already proposed as part of Package C) and would likely push the total reduction in parking in Package C towards 400. What do you think? Whatever it is, make sure you go the Newtown Connections website and have your say! ​The good news is that it is now proposed that NZTA will fund 75% of the cost of the upgrade by including it in an integrated plan for high-quality biking and walking connections from the south coast to the city. Mayor Justin Lester says "with the new government’s policy statement on transport, we have the opportunity to make more improvements in more suburbs with the same amount of ratepayer funding [approximately $8 million]. By partnering with NZTA under the new Government Policy Statement, we have the opportunity to fund up to $32 million worth of changes in these areas by 2021, with the Council paying 25 percent and NZTA paying 75 percent”. 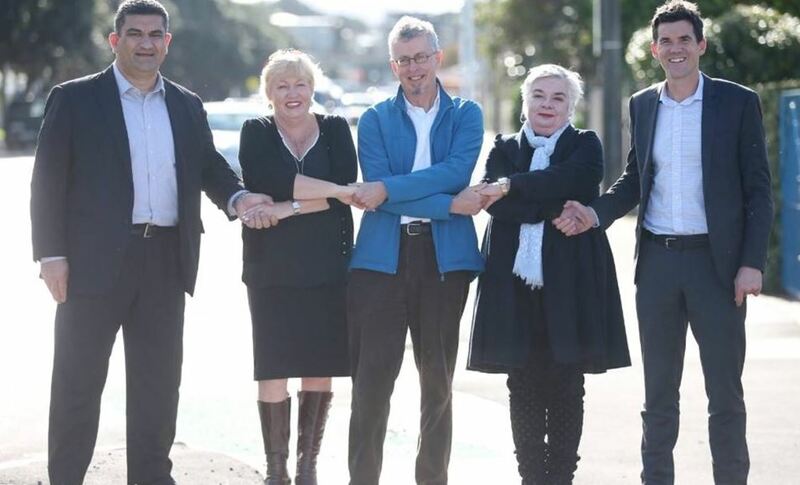 $32 million is a massive investment into improving transport options in the southern suburbs. Although it's disappointing to be facing yet more delay before the upgrade begins it's really hard to see how the city council could possibly turn down the possibility of such a substantial offer of funding from NZTA. In fact, it would be financially irresponsible not to integrate the two projects. It's also great to see NZTA finally recognising the Island Bay Cycleway as being part of a bigger network picture. Props to the current government for creating the policy settings for that to happen.